Stock photo of Horseshoe Falls at dusk as seen from along the Niagara River at Niagara Falls in Ontario Canada. 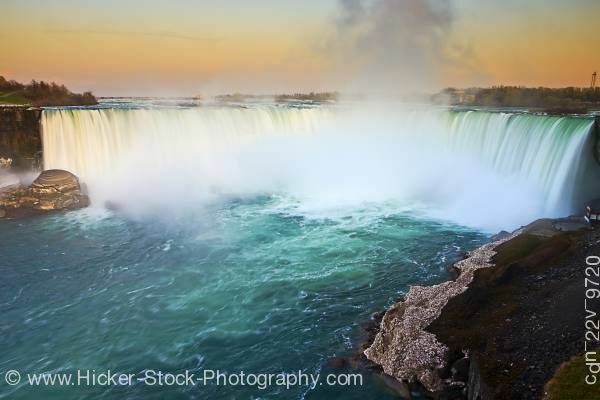 This stock photo shows Horseshoe Falls across the mid section of the scene with a bright orange and gold sunset above and the swirling blue and green white-capped waters below, along the Niagara River at dusk, Niagara Falls, Ontario, Canada. Mist rising from the falls can be seen reaching into the sky above this Canadian icon, along with rocky outcrops of land along both sides of the river.